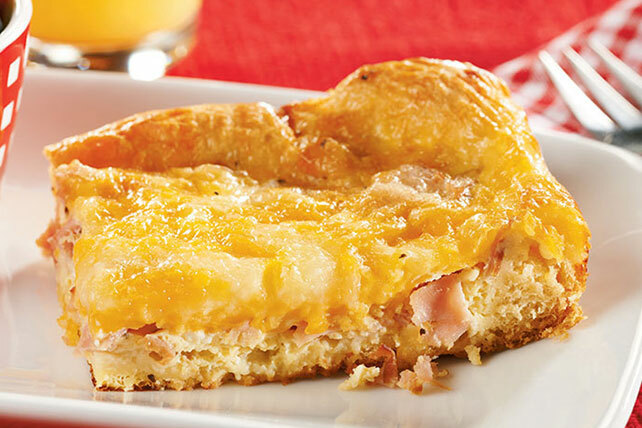 Dig into our Brunch Casserole and enjoy piping-hot eggs, two kinds of cheese and smoked ham all baked into a flaky, rich crescent roll crust. Unroll dough onto bottom of 13x9-inch baking dish; press to evenly cover bottom of dish, firmly pressing perforations and seams together to seal. Top with ham. Whisk eggs, milk and pepper until blended; pour over ham. Top with cheeses. Prepare using reduced-fat refrigerated crescent dinner rolls, fat-free milk, KRAFT 2% Milk Shredded Cheddar Cheese and KRAFT 2% Milk Shredded Mozzarella Cheese. Substitute 2 cups KRAFT Shredded Colby & Monterey Jack Cheeses for the 1 cup each cheddar and mozzarella cheeses. Substitute 1 lb. breakfast pork sausage, cooked and drained, for the ham.